Today I'm sharing with you my spring shoe lineup! 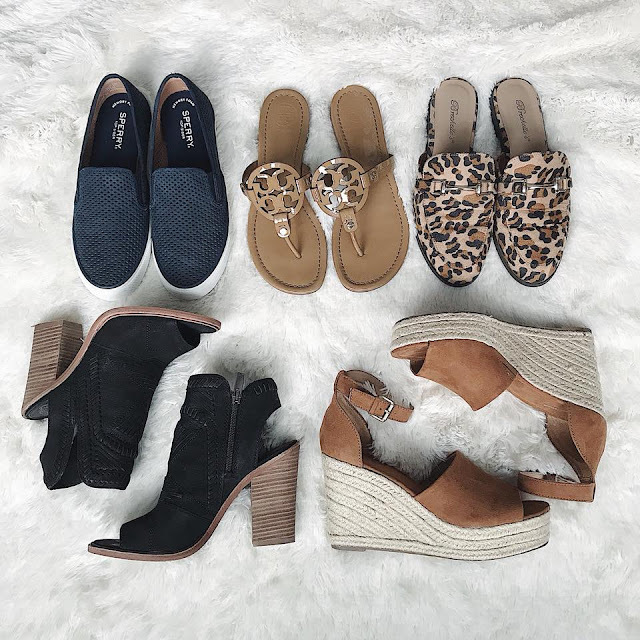 I have so many more on my wish list (hello espadrilles!) but these are my favorites that are currently sitting in my closet. Sperry Seaside Perforated Sneaker - After hearing so many good reviews, and then seeing them go on major sale, I snatched up a pair of these Sperry perforated sneakers. I've literally worn them for like 5 minutes since I've gotten them, and they're pretty snug and stiff right now, but I hear they break in and become super comfortable. They run true to size but are a bit narrow, so I'm hoping they stretch out. I'm also loving these, and they have great color choices. Tory Burch Miller Flip Flops - Best. Shoes. Ever. Hesitant to buy because of the hefty price tag? Check out my article about why they're actually a better value than most of the other shoes in your closet. These run very small. I ordered one full size up and got an 8 instead of my normal size 7. Breckelle Leopard Mules - I bought these on Amazon back in the fall for $20, and while I was afraid they'd fall apart right away or fit weird, they've been one of my favorite shoes of the past year. The leopard print is currently sold out, but they have solid colors in stock, and I'm linking up some similar leopard mules below. The Breckelle's run small, so I suggest sizing up a half a size. Vince Camuto Peep Toe Booties - These were my splurge booties that I purchased last fall, but lucky you, Target's new Universal Thread line came out with the best dupes for only $35! I don't know about the Target ones, but the original pair runs true to size. Universal Thread Espadrille Wedges - I've been wanting these Marc Fisher wedges forever, and thanks to Target, I got a nearly identical pair for only $33! It looks like the Target ones are currently out of stock, but I'm linking up lots of similar options of all prices ranges below.